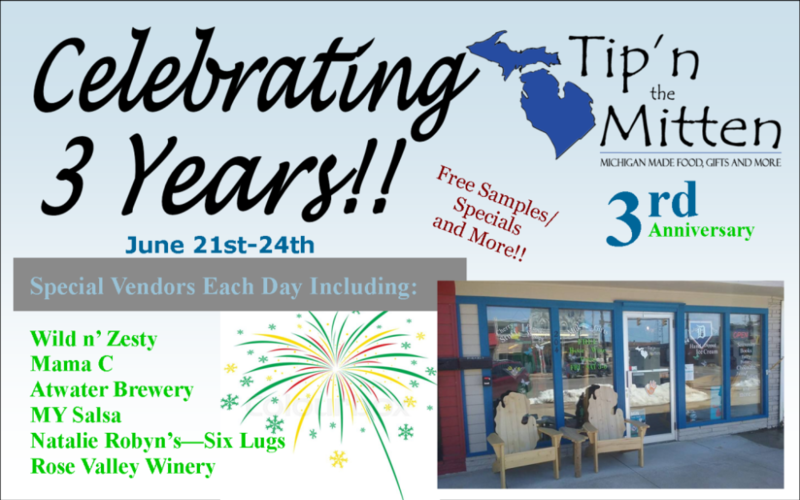 Celebrate 3 Years with Tip’n the Mitten!!! Its June and that means our anniversary is just around the corner! This year as we head into our 4th summer, we celebrate 3 years since we first opened our doors! Thanks to our many devoted returning customers and the many first time visitors, we have sailed through 3 years!! This year we would like to celebrate with you all again! In honor of this occasion we are going to be running sales, tasting special foods and welcoming some of our favorite vendors! Thursday – June 21st – Come on in and visit Wild n’ Zesty Jellys – Unique, these jelly’s are both sweet and spicy! Saturday June 23rd – Meet Six Lugs Cherry products, one of our top sellers, and our wonderful winery, Rose Valley Winery! Author/Illustrator Lori Taylor will be book signing her books from 1-5!! Her most well known books are her Holly Wild series for ages 7-12. We will also be having an AMAZING cabernet cake from Creekside grains for our anniversary on Saturday!! Thanks everyone for the first three years, and lets cheers to the next 10!